Pink peppercorns suggest nouvelle cuisine, or as it is called in Italy, nuova cucina, but in reality they have been used in Venice for many centuries. Venetian traders introduced them from East Africa and, called “grains of paradise,” they were first recorded in 1214. 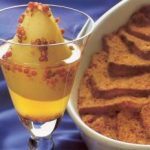 Fanciful Venetian glass goblets set off the poached pears. Adam Tihany would serve each in a different glass. Combine the wine, water, sugar, and peppercorns in a deep nonreactive saucepan. Do not use a plain aluminum or iron pan. Bring to a boil and simmer gently for 5 minutes. Add the pears and simmer for 15 minutes. Remove the pears from the saucepan and transfer them to a bowl. Boil down the cooking liquid until it is reduced by about half. Pour over the pears and refrigerate for at least 4 hours or overnight. 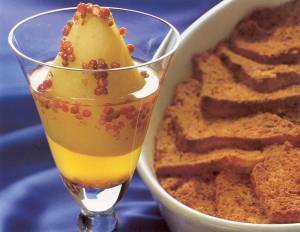 Serve the pears in deep dishes with the poaching liquid.